This invention relates to an automatic plate washing machine. The automatic plate washing machine has a revolving stand adapted to be revolved by means of a set of gears which are rotated by a motive means. An equipment holder, mounted onto the revolving stand, is provided for holding different means like blade carrier, plate holder, soap water sprayer, washing brushes, hot water sprayer for carrying out washing operation of the plates in the washing chamber. An upper holder is provided on the top end of the equipment holder to keep the above means in its respective positions. Soap water tank and hot water tank are mounted on the top of the plate washing machine. An air pump is provided to spray hot water onto the plates to clean them. 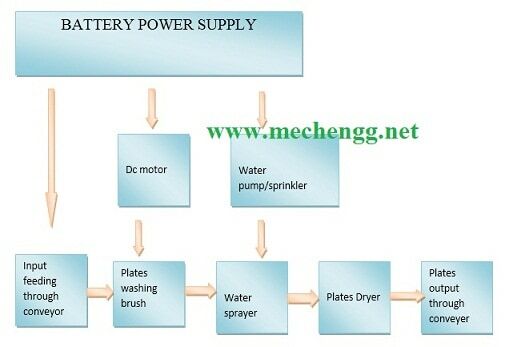 An electricity supplier is provided to supply electricity to the different means operated by electricity. Feeding means and delivery means, adapted to be operated by another motive means, are provided for feeding the dirty plates to the washing machine and delivering the cleaned plates from the washing machine. The new Plate Washing Machines series WP have been developed and manufactured in a sturdy and easy way to allow economic and quick washing and gumming of plate after printing, thus enabling a perfect filing. Automatic starting of working cycle; running speed is adjustable. The plate passing in the machine is straightened from possible bending due to the printing machine clamps, then it enters the two not-flammable emulsion washing stations, where oscillating brushes provide for a thorough ink removal. Rinsing with water: gumming by means of a dosing roller and drying complete the cycle. The stainless steel rollers are coated with solvent resistant rubber. The two ink cleaning tanks are fed from two removable 30-liter tanks mounted on the machine base. Microcontroller unite will controls the entire automatic plate washing machine system. Initially plates will automatically feed through automatic infut feeding conveyer and these plates will be cleaned through washing brush is mounted inside the machine. These washing brushes will be fixed to D.C motor by control through microcontroller. In these microcontroller unite brushing speed will be controlled. After washing plates moved to water sprayer. In this level plates will rinse in water, and this water spraying speed is controlled by microcontroller. Then plates will be drayed in hot air and output through outlet conveyer. The electrical components are put under the entrance table. Gum in a separate container is fed to the machine only when the plate passes. Automatic washing of gumming rollers. Plate transit speed is adjustable and running reversal is possible in case of jam. A recycling system of rinsing waters can be mounted, upon request, on the Plate Washing Machine WF.